Once upon a time, your father, grandfather, or great-grandfather just walked into a building that had a “Help Wanted” sign out front and took the job that he kept for 30 years, retired with a gold watch and a pension, and never needed to worry about a college degree. Whether it really happened or not, more people believe that story than believe in the moon landing. Well, that’s not how it is – not anymore, and maybe not ever. Today, a professional career usually starts with a college degree, but the benefit of living in the 21st century is that obtaining that bachelor’s degree does not require you to quit your job or even live near a college campus. Just a few years ago, an online degree was a big risk, and most employers didn’t trust the kinds of institutions that specialized in online degrees. That’s all changed; today, accredited and reputable colleges and universities all over the world have fully online degree programs, and many of them are designed specifically for the most sought-after careers in the job market today. It may be stating the obvious, but according to LinkedIn, almost all of the most promising jobs of 2017 – the ones with the best pay, best job prospects, and best future opportunity – are in technology, finance, and healthcare. It’s simply a reflection of our times: we have a rapidly aging population, making healthcare a priority like never before, and when you put together the retirement of the largest generation in American history (the Baby Boomers) with the maturity of the second-largest (the Millennials) in an uncertain and complicated economy, there’s plenty of reason the financial industry would be expanding. And technology – forget it. If we have to explain why the technology job market is busting at the seams, it’s already too late for you. If you started your career with an associate’s degree or a certification, the lack of a bachelor’s degree may be the only thing stopping you from a position making six figures. It can be hard to really know your options, though, which is why Value Colleges exists. Our mission is to provide prospective students, working adults, and anyone else with the information they need to make an informed, financially sound decision about their educational options. 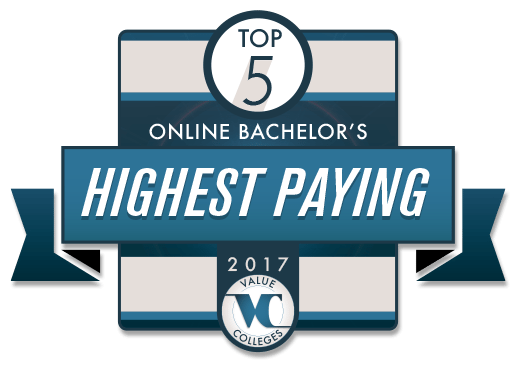 The Top 5 Highest-Paying Jobs With an Online Bachelor’s Degree listing isn’t meant to be a be-all, end-all guide – it’s a starting point, a way of giving you the hope that a better career is out there for you, and you’ve got what it takes to get there. We’ve already said that the world runs on computers, but Software Developers are the people who make the computers run. Computer programmers do the nitty-gritty of writing code and solving technical issues, but the Developer is the person who guides the whole process. It’s the Software Developer who analyzes data and decides what kinds of programs are needed, figures out what the user is going to expect the tools to do, designs the overall schema for a software project, and organizes and manages the team that makes it all happen. At some big tech companies, multiple developers may collaborate on a major project, taking on small pieces, but in other settings, a single Software Developer may see a product through the whole process, even testing and doing maintenance. There’s a large and growing job market for experienced Software Developers; the BLS projects 17% growth between 2014 and 2024. In some specialized areas – mobile apps, for instance – the expected growth is even faster. With so much demand for software to control and automate virtually every aspect of the economy, the people who have the know-how to lead are going to be worth their weight in gold, and paid accordingly. You can become a Software Developer with only a bachelor’s degree, and online BS programs have grown exponentially, with just about every reputable computer science department developing an offering that helps working professionals earn their place in a job that pays a median salary of over $100,000. It’s likely that you think of Financial Advisors as being for the very, very wealthy. After all, who else needs someone to tell them how to handle their money, but someone who has so much of its they can’t keep up with it themselves? But if you think that, you may be missing out on the opportunity to enter one of the fastest-growing careers in the nation. There’s more demand for financial advisors than ever, and a big reason why is the growth of jobs that don’t fall into traditional “jobs.” Self-employment has increased tremendously, from small-business entrepreneurs to independent contractors, and all of those people need the kind of help that Human Resources would provide in a traditional job: retirement, estate planning, mortgage, college savings, and more. That’s why the BLS sees the career of Financial Advisor booming: they predict 30% growth in the 2014-24 decade. Some of those people will be providing services for the very rich, of course, as they always have, but Financial Advisors are increasingly needed for ordinary people who need advice handling self-employment taxes and making sure they will have a home and income in their old age. Between retiring Baby Boomers, Generation Xers entering middle age, and Millenials hitting an unstable job market, there’s never been more need for Financial Advisors, and they’re getting paid – a median of nearly $90,000, in fact. If you’re good with numbers and have the people skills to help clients, you can become a Financial Advisor with only a bachelor’s degree, and colleges and universities all over the country have developed online programs that can make it happen. In this day and age, a company or agency is only as good as its computer network. Poor performance means lost time, lost revenue, and lost trust from customers and clients. When an organization’s administrators discover that their computer systems aren’t working effectively for their needs, they call a Computer Systems Analyst. Analysts may work as independent consultants, for a firm that is hired by companies, or, in the case of very large corporations, for the corporation itself. They analyze data to determine weaknesses in a computer system, keep track of the most current technology, and devise solutions to an organization’s network-related problems. They are the fixers, and top-notch problem-solving skills, creative and critical thinking, are their tools. You might be surprised to find, then, that the minimum education necessary to become a Computer Systems Analyst is just a bachelor’s degree, and that the education needed to get there is readily available in an online format from a plethora of colleges and universities. You’re not likely to have any trouble finding a job – with job growth at 21%, according to the BLS, you might just be fielding more offers than you can handle before the diploma is even in your hand. There are so many new technologies, and so much growth in the business sector, that keeping up your education is essential, but a median income of nearly $86,000 should make it seem well worth your while – especially when you don’t have to leave your current job to obtain it. Not a day goes by without some new technological wonder in the news – not just in the high-tech field, where smaller and faster and smarter gadgets are the norm, but in areas we may think humanity has already perfected, whether it’s bridge-building or household appliances. And while all the praise tends to get heaped up on the visionaries who dream up all of the machines that change our life daily, the media never quite gets to the real people on the ground who make all those visions into reality: the Mechanical Engineers. They are the technicians who make sure that the machines and structures imagined by civil engineers, aerospace engineers, and every other kind of engineer, actually work – designing tools, building prototypes, and testing their creations. For modern society to keep progressing technologically, Mechanical Engineers are essential, and the job market is growing steadily. The BLS finds the field on an upward trajectory, increasing 5% in the years between 2014 and 2024, and while that’s just around average for the American job market, there’s no reason to believe it could decline. If anything, as manufacturing becomes more mechanized and machines take on more roles in our society, the need for people to design and build them can only increase. Engineering schools across the US are putting together top-notch online Mechanical Engineering programs to meet the need for qualified professional experts, and a median salary of $83,590 should ensure that there will continue to be capable people to fill them. LinkedIn has shown that the healthcare sector is one of the most promising areas in the American job market, and that is certainly the case for Registered Nurses. With the healthcare industry in an unprecedented boom, nurses are finding themselves in demand and in a position to make demands – higher pay, better benefits, and more manageable hours, among them. That’s because the healthcare system absolutely grinds to a halt without them. Nurses work in hospitals, clinics, nursing homes, primary care offices, and every other place people receive healthcare, making them the engines that power the whole machine. Performing direct care, diagnosing symptoms, educating patients and the general public – it all happens because of a nurse. And Nurses, fortunately, are increasingly well-compensated for all their work and expertise. The median salary, according to the BLS, is around $67,500, a considerable income for a position that does not require a master’s degree. While entry-level positions in nursing can be had with a certification or an associate’s degree, most RNs today will find themselves needing a bachelor’s degree to be hired. In fact, the American Association of Colleges of Nursing strongly recommends making the Bachelor of Science in Nursing the standard education level for practicing nurses. Fortunately, hundreds of nursing schools around the US have recognized the need for qualified nurses in a job market that is growing by 16%, and have made online BSN programs one of the most common online degrees around. Today it is easier that ever to earn a reputable BSN online.